At the on-going Computex 2017, Asus has also unleashed the VivoBook Pro, another thin an light laptop with great specs for the low starting asking price. Like its lower-end sibling, the VivoBook S, the new Asus VivoBook Pro is also made out of stylish aluminum metal frame. It has an up to 4K UHD screen with 100% sRGB for extra crisp and vibrant images. Inside, the laptop runs on either Intel Core i5 or i7 H-series processor and has an up to GTX1050 graphics unit. It also goes with up to 16 GB of RAM, and 512 SSD + 2 TB HDD storage. 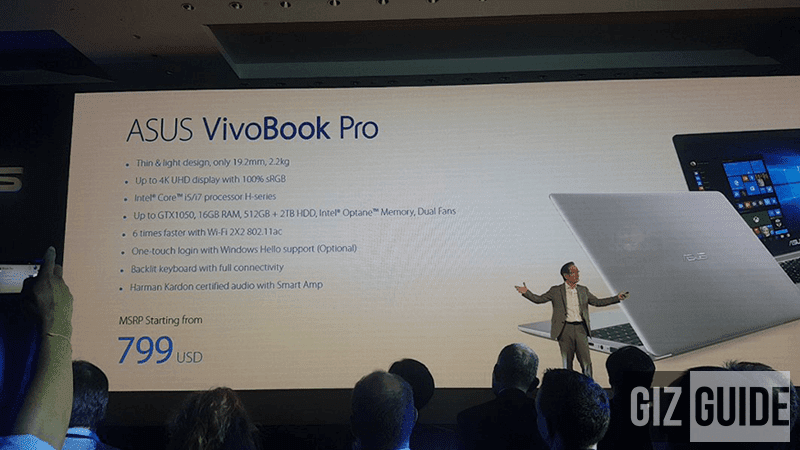 Like the VivoBook S, the VivoBook Pro also has WiFi 2x2 802.11 ac with up to 6 times faster speed and has an optional backlit keyboard and one touch login with Windows Hello support. It has Harman Kardon certified audio with Smart Amp for better audio output. Price starts at just USD 799 or around PHP 40K.